Today, 1st of September, is Nomination Day for Singapore’s 17th parliamentary elections. Also known as the General Elections 2015 (GE 2015), a total of 89 parliamentary seats were up for grabs. They are divided into 16 Group Representation Constituencies (GRCs) and 13 Single Member Constituencies (SMCs). Between 11 am and 12 noon today, electoral candidates from the nine political parties as well as independent candidates have filed their nomination papers at the nine Nomination Centres located around the island. As the country gears up for Polling Day on Friday, 11 September 2015, political parties will work round the clock to ensure that they do whatever they can to win the hearts and minds of some 2.46 million eligible voters at the hustings. While the dust has barely settled from the celebratory high of our Golden Jubilee (aka SG50), the air is already thick with action. Happening once every four years, this year’s election is seen to be significant. It will be the first for the ruling People’s Action Party (PAP) without the guiding presence of Singapore’s founding prime minister Lee Kuan Yew, who passed away on 23rd March this year. This elections will also see all 89 Parliamentary seats contested for the first time since Singapore’s independence 50 years ago. In case you don’t already know, Radin Mas will be one of the hotly contested SMC. Located in the South Western side of Singapore, Radin Mas comprises neighbourhoods like Tiong Bahru, Redhill, Bukit Merah, Bukit Purmei and the Mount Faber area. According to the Singapore Elections Department, Radin Mas has some 28,885 eligible voters. 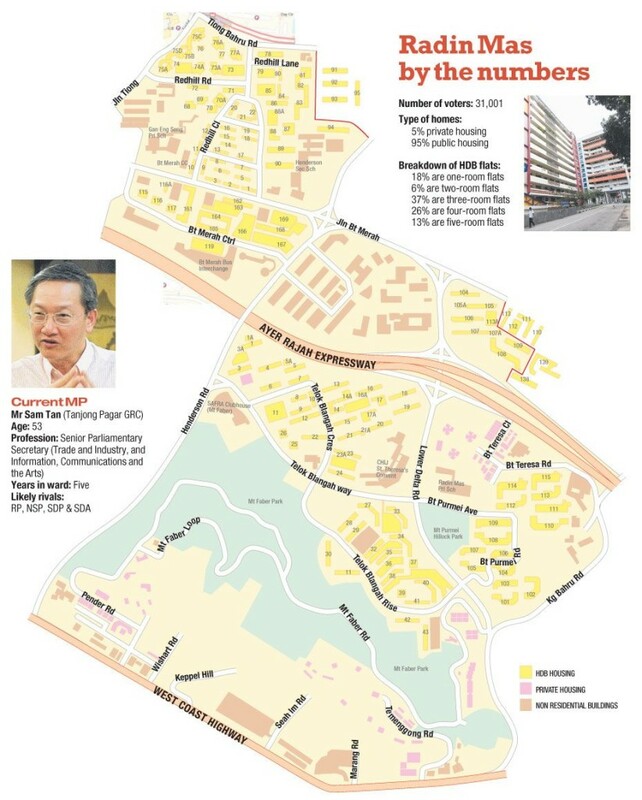 This infographic from The New Paper (dated 2011) reveal that the majority (95%) of residents in Radin Mas are living in HDB flats. As a 13-year resident of a mature HDB estate in Radin Mas, I regularly visit the various neighbouring precincts around my area for a meal at one of the nearby hawker centres. My frequent haunts include the ABC (Brickworks) market, Alexandra Village, Bukit Merah View, Redhill food centre, Telok Blangah Crescent, and Tiong Bahru Market. I frequently also run around the Mount Faber and Telok Blangah Hill area. While it has a sizable percentage of one, two and three room flats, Radin Mas is also located just next to the city and near the happening southern waterfront area of Singapore. The constituency is a study of contrasts. Population wise, the SMC contains a large community of older residents, particularly in the Redhill and Bukit Merah area. 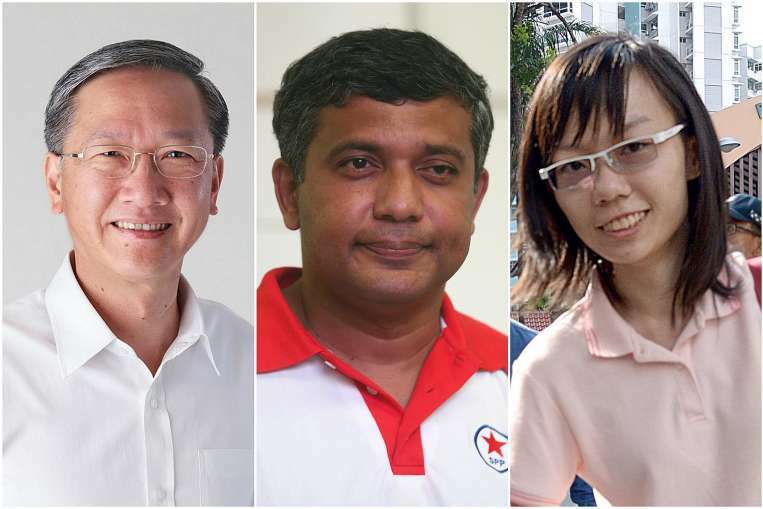 A three-cornered fight is slated to take place here between incumbent People Action Party’s (PAP) Member of Parliament (MP) Sam Tan, Reform Party’s (RP) Kumar Appavoo, and independent candidate Han Hui Hui. The incumbent Mr Sam Tan is a long serving MP for Radin Mas. Beyond his role as the MP for Radin Mas, Mr Sam Tan is also the current Minister of State in the Prime Minister’s Office (PMO), as well as the Ministry of Culture, Community and Youth (MCCY). I have frequently seen him in action both at constituency events as well as door-to-door visits, and have experienced what he has done for the estate. Mr Kumar Appavoo of RP is a new candidate in the elections. I have not seen nor heard of him prior to the hustings. Han Hui Hui, on the other hand, is pretty well known for her political activities at Hong Lim park. She has spoken up most stridently against current rulings on the CPF (along with her compatriot Roy Ngerng). So which qualities would I look out for in a political candidate for Radin Mas SMC? What would tilt the balance for me? First and foremost, it is important for the MP whom I choose to be earnest, sincere and caring. By this, I mean that the candidate should be perceived as somebody whom residents in this SMC can connect with, and who genuinely cares for their welfare. As a neighbourhood populated with the elderly, it is especially important for the candidate to be familiar with the pressing issues of silver haired voters here. While doing so, the person should also be able to strike a chord with the younger and more educated residents living in estates like hipster friendly Tiong Bahru. An effective MP is one who can withstand the cut and thrust of national politics. While prior experience in politics may be useful, it isn’t a strict necessity, so long as he or she is able to deftly manage the web of human relationships. To govern a municipality well, a good candidate would also need to have some expertise in management. As a leader of a constituency, he or she has to guide and lead town council staff and grassroots volunteers. Beyond that, the candidate would also need to inspire, motivate and encourage the staff, volunteers and residents. It may also be advantageous for the candidate to have access to the experience, networks and resources of a larger organisation. An MP needs to be able to think on his or her feet, and have the mental and emotional strength. He or she needs to withstand often intense public scrutiny while maintaining his or her cool. A good candidate also needs to possess immense stamina and resilience. He or she has to discharge municipal duties with professionalism and courtesy. With a positive demeanour, a good MP has to also display grace under pressure, especially during trying meet the people sessions with difficult or unreasonable residents. As a representative for the people living in a neighbourhood, an MP must have a servant’s heart. He or she needs to descend from the high pedestal of parliamentary duties to attend to the seemingly mundane affairs of residents. An advocate for resident’s needs and wants, the candidate also needs to be humble enough to listen to what residents request for, weigh it against other priorities, and champion for the right causes. Beyond caring for the community, a good MP must also possess both telescopic and microscopic vision. What this means is that the candidate should be equally adept in handling the day to day issues of residents (down to individual households), while navigating the macro issues of the State. He or she needs to have an eye on both policy issues that affect the lives of Singaporeans and residents while not forgetting communal responsibilities. Finally, and perhaps most importantly in a mature SMC like Radin Mas, the elected MP needs to connect well with heartlanders. As a sizable proportion of residents here live in smaller flats, their concerns could be quite different. The elected MP would also need to reach out to the disproportionately higher number of older residents here – many of whom have received limited education. While doing so, he or she would also need to connect with the younger population in the Radin Mas community, particularly those living in the private estates around the Mount Faber area and the increasingly gentrified Tiong Bahru area. With its close proximity to town and to the southern waterfront area, it is likely that this area will attract more and more PMETs in the future. So who do you think I should choose for GE2015? The incumbent PAP candidate, Mr Sam Tan Chin Siong (aka MOS for PMO and MCCY)? Reform Party’s new contender, Mr Kumar Appavoo? Independent contentender, Miss Han Hui Hui?